Yippee Ki-Yay or Yippee Kaput? Release Date: February 14, 2013 – U.S.
2007's mind-numbingly mediocre "Live Free or Die Hard" managed to drag down Bruce Willis, the usually electrifying Timothy Olyphant, and the entire "Die Hard" series. That fourth movie was one sequel too many. 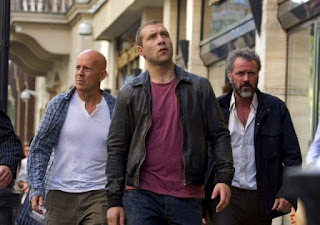 Does the fifth and latest installment – "A Good Day to Die Hard" – restore the blockbuster franchise to its former glory? Not quite, but it deserves points for trying. One thing it can’t be called is boring. It has been 25 years since the events of the first film. John McClane (Willis) is older, wiser, and still wisecracking. McClane once again has to rescue a family member. In the original, it was his wife. This time, it's his son – and he's in Russia. In that small way, "Good Day" takes the series back to its roots – but as the exotic locale indicates, this ain't exactly your daddy's "Die Hard." There's an early, amusing scene in a cab. McClane attempts to give directions in Russian. The cabdriver (Pasha D. Lychnikoff) responds in English and eventually starts singing American songs. No, I'm not kidding. But that's merely the calm before the storm. What follows is one of the most ridiculous and insane car chase sequences ever committed to celluloid. The earlier "Die Hard" films were never exactly known for their realism, but they're downright subdued compared to this. Eventually, McClane finds his son, Jack (Jai Courtney), who is involved in "spy s***." It's hard to tell if "Good Day" is trying to be a spoof of "The Transporter," "Bond," or the other "Die Hard" movies. Jack's secret mission is to protect a Russian named Komarov (Sebastian Koch, looking like Mel Gibson's mugshot) who has access to a very important file. It's "a matter of national security," of course. Isn't it always? From there, father and son bicker and hurtle from one over-the-top action set-piece to another until they eventually reach – are you ready for this? – Chernobyl. Yes, that Chernobyl. "Good Day" goes for broke with goofy exuberance, reveling in a series of breakneck stunts and massive explosions. Just about every scene is wildly implausible – completely defying all logic, not to mention gravity – and yet I found myself smiling, swept away by the sheer scale of it all. Nothing is too outlandish for this movie. Here's an example: one of the villains, Alik (Rasha Bukvic), explains that he turned out that way because he was never allowed to follow his true passion in life. To prove his point, his taps his feet on the floor and expertly performs a dance number. 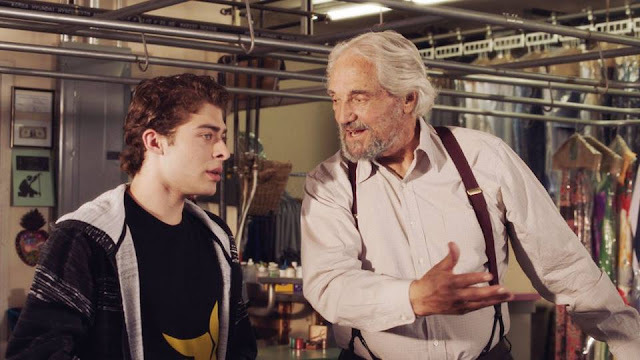 A tap-dancing villain – that's the type of movie this is. The reason it works, at least somewhat, is because of the chemistry and banter between Willis and the well-cast Courtney. The younger McClane holds his own. Unlike, say, Mutt from "Indiana Jones and the Kingdom of the Crystal Skull," Jack never feels artificially tacked-on. Is this a good "Die Hard" movie? I'm still not sure. But as absurd as "A Good Day to Die Hard" is, I undeniably had fun watching it.